What makes MedPro cosmetic lasers so unique? We eliminate the Middle Man, and You save the difference! Buy from us, "The Source" - before purchasing from a dealer or broker who may well have filled your equipment requirement by obtaining the equipment directly from us! It just makes good "CENTS" - Call us now! Let us show you how to save your money! Not all Spas, Clinics, Hospitals, Imaging Suites and Private Practices need the latest and most expensive Aesthetic, Diagnostic Imaging & Medical Equipment available. MedPro cosmetic lasers offers the world an opportunity to improve the level of patient care and remain competitive by upgrading their Aesthetic Lasers, Microdermabrasion, Cellulite Therapy, Imaging & Medical Equipment. 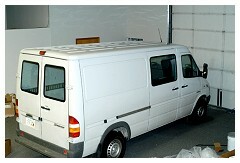 In Addition - Our value-added services are available to everyone! The Internet has allowed us to reach Aestheticians, Plastic Surgeons, Dermatologist, Hospitals and Private Practices and Clinics of all sizes throughout the globe. We have seen a significant increase in our sales since driving our business on-line. Health care institutions and providers are not only looking for greater selection of equipment, but they also want the re-seller to provide an expanded range of services, such as logistics, reconditioning and re-warranty. These value-added services are available to each and every one of our valued customers. MedPro cosmetic lasers is driven by customer-focused, quality driven, growth-oriented business strategies. Our offerings include networking, marketing and productivity tools. 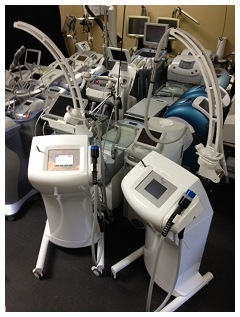 Our vast equipment array includes Cosmetic Lasers, Cellulite Therapy, Microdermabrasion, Ophthalmic Lasers, Surgical Lasers - all from a multitude of original equipment manufacturers! Save from 30% to over 70% by taking advantage of our, Repossessed, Off-Lease, Trade, Consignment and Liquidations! So, why not eliminate the Middle Man and save the difference! Buy from us, The Source - before a dealer or broker tries to sell you equipment they have sourced from us! 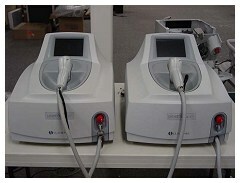 MedPro, Inc. buys and sells medical lasers. 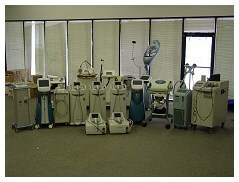 MedPro, Inc. services all lasers in-house. Our laser technician makes house calls too! Want a like new laser? MedPro, Inc. is for you.